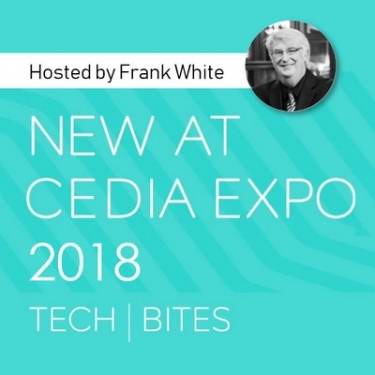 Celebrity entertainer Frank White hosts the first CEDIA Expo TechBites, featuring elevator pitches from 11 vendors touting new smart-home and A/V products. "I mean, come on, Frank White is hosting." “TechBites will tell product stories about the newest innovations coming to CEDIA Expo in a short, dynamic format,” states Julie Jacobson, co-founder of EH Media. “I look forward to the presentations not only for the information, but for the entertainment as well. I mean, come on, Frank White is hosting." TechBites will be hosted by industry icon Frank White of StayTuned. The TechBites audience will experience a lively, three-minute presentation from each brand, followed by a three-minute Q & A session where the brands will field questions from the media, influencers and industry pros. TechBites will be held on both September 6 and 7, 2018 on the 2018 CEDIA Expo Smart Stage in San Diego.